You like CSS in JS, but you don't like having to create entire component functions just for styling purposes. You don't want to give a name to something that's purely style-related. And it's just kind of annoying to do the style-creating, className assigning, and props-forwarding song and dance. In fact, it's even better, because there are a bunch of features that make composing these components together really nice! Try this out in your browser here! So that's the basics of this solution... Let's get to the details! global: dist/glamorous.umd.js and dist/glamorous.umd.min.js - exports itself as a umd module which is consumable in several environments, the most notable as a global. jsnext:main and module: dist/glamorous.es.js - exports itself using the ES modules specification, you'll need to configure webpack to make use of this file do this using the resolve.mainFields property. 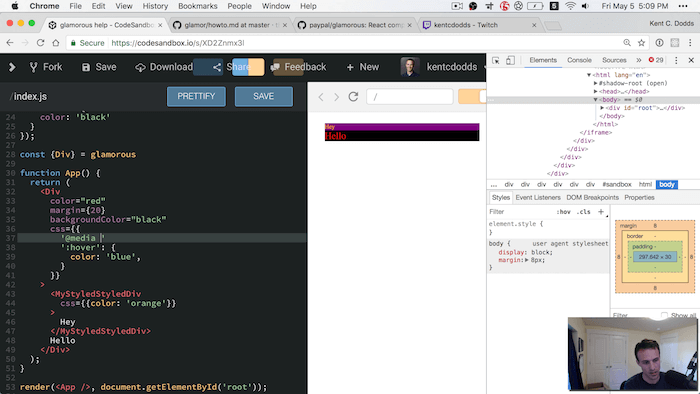 Here is a basic example that shows you how to get started making component with css-in-js magic. The glamorous function is the default export. It allows you to create glamorous components that render the styles to the component you give it. This is done by forwarding a className prop to the component you tell it to render. But before we get into how you wrap custom components, let's talk about the built-in DOM components. For every DOM element, there is an associated glamorous component factory attached to the glamorous function. As above, you can access these factories like so: glamorous.div, glamorous.a, glamorous.article, etc. The GlamorousComponent is what is returned from the glamorousComponentFactory. Its job is to get all the styles together, get a className (from glamor) and forward that on to your component. Having to name all of that stuff could be tedious, so having these pre-built components is handy. The other handy bit here is that the props are the styles for these components. Notice that glamorous can distinguish between props that are for styling and those that are have semantic meaning (like with the Img and A components which make use of src and href props). The css prop can be used to provide styles as an object. The most common scenario for using props is to override the style of an existing component (generated by glamorous or not). That can be achieved by using the props className, css and theme or simply component composition with the glamorous() function. If you're interested in knowing more about using the theme prop, see the Theming section instead for a more detailed explanation. In this section we'll explain how to use className, css and composition to override the styles of a component. Let's see how that can be done in the examples below. For each className you provide, the GlamorousComponent will check to see whether it is a glamor generated className (can be from raw glamor or from glamorous, doesn't matter). If it is, it will get the original styles that were used to generate that className and merge those with the styles for the element that's rendered in a way that the provided className's styles win in the event of a conflict. Any classNames that is not generated by glamor, will just be concatenated with the one that is. This can be the same type as any of the styles provided (as in glamorous.div(...styles)). If specified, it will be merged with this component's styles and take highest priority over the component's predefined styles. If we just want to extend the styles of an existing component it can be done by using the glamorous() function. In fact, the built-in DOM component factories provided are just an abstraction of this function, so glamorous.div could be written as glamorous('div') instead. // style conflict, the last one wins. To do animation with glamorous, you can use regular CSS transitions for simple things, and for more advanced stuff, you can use keyframes via glamor's css.keyframes API. glamorous offers a version for React Native projects called glamorous-native. You can learn more at the glamorous-native project. Made with 💙 by PayPal and contributors.